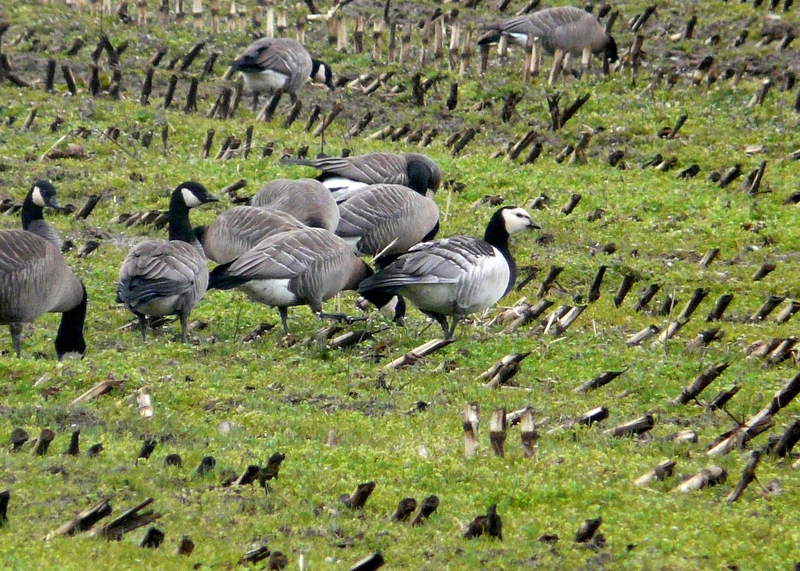 A Barnacle Goose was found at Ridgefield NWR in southwestern Washington this week. 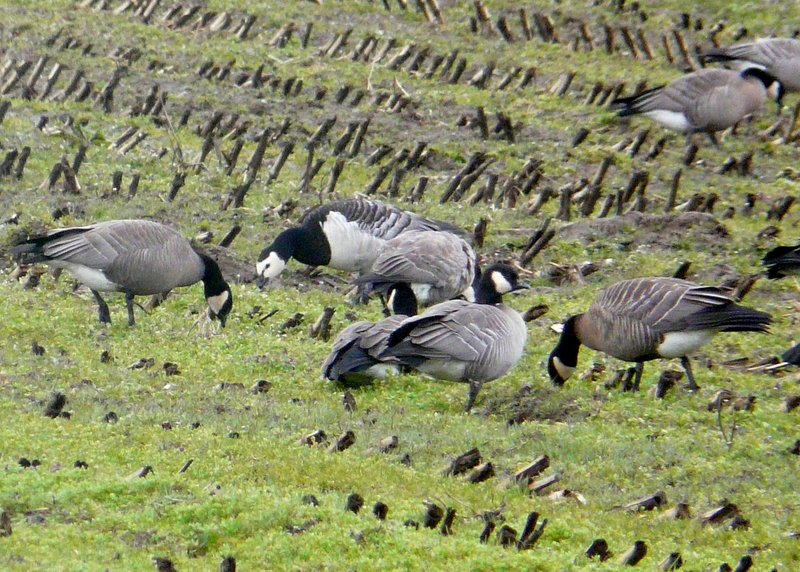 The bird was with a flock of Ridgeway’s Cackling Geese. When an unexpected species of waterfowl appears, the discussion instantly turns to whether this is a “countable” bird (a bird that takes a wrong turn on its own to show up on the wrong continent) or a bird that has escaped from captivity. Many species of waterfowl are kept in “collections,” and sometimes these birds escape their captors and join up with the locals. Many birders assume that a Barnacle Goose on the west coast of North America must be an escapee, or the direct descendant of an escapee. But the same could be said for every Eurasian Collared-Dove, European Starling, and House Sparrow currently in North America. It is certainly plausible that a Barnacle Goose hatched in western Greenland, headed west instead of east, joined with a flock of Cackling Geese in the Arctic, and made his way to Washington. Populations of Barnacle Geese are increasing, and the species is showing up in eastern North America with greater frequency. At some point it seems inevitable that this species will occur in the western U.S. Unfortunately, the only way to prove where the bird came from would be if the bird had been banded on the nesting grounds. This particular bird wears no band, nor does he show any signs of captivity (clipped hind toes or unusual feather wear). Given that this bird is associating with a flock of Ridgeway’s Cackling Geese (another long-distance migrant from the Arctic), and shows no sign of former captivity, I am inclined to consider him a naturally occurring vagrant. Of course, the goose doesn’t care what we call him. Whatever his origins, I am grateful for the opportunity to see a free-flying Barnacle Goose without my having to visit Greenland or Scotland to do so. 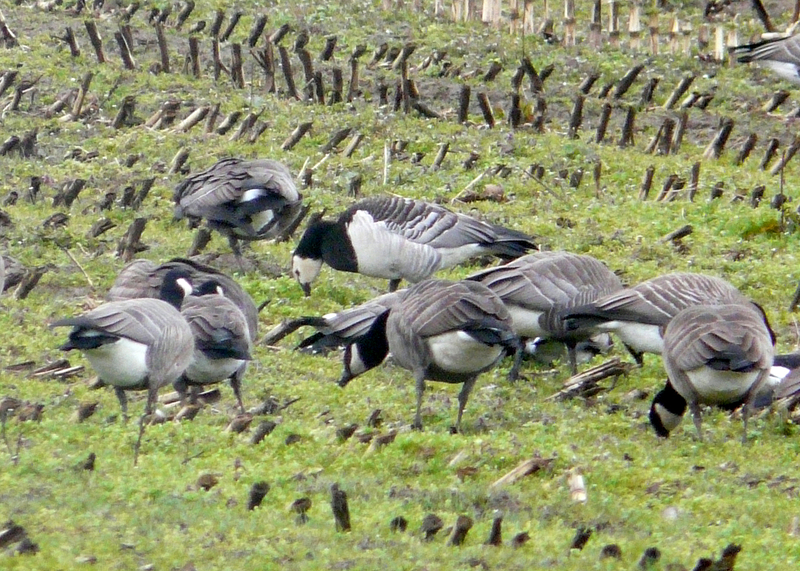 This entry was posted in beyond OR, rarities and tagged Barnacle Goose, Ridgefield NWR. Bookmark the permalink. Jon, Feel free to use my Barnacle Goose photo. Please provide photo credit and a link to my site. At that time, I was reading the plastic neck collars on Dusky and Cackler geese, and saw this bird throughout that winter. It returned for the next 2 seasons as well. I saved a number of my goose records for Finley, Ankeny, and Baskett Slough refuges & environs, and would need to find them and get an idea of where it was seen through those years. It was always associated with the flocks of cackling geese.